Daredevil returns with a new #1 in July! I’ll be back with my review of Daredevil Reborn #2 later today (pardon my tardiness, I was at an over-night conference…), but in the mean time, I just wanted to share another piece of news that broke less than 24 hours ago: Daredevil will be returning with a new #1 in July. I had actually had a bird whisper in my ear that a relaunch was in the works (aren’t I good at keeping my lips sealed? ;)), but now we’re looking at a definite timeframe. The new creative team will be announced during C2E2 in Chicago. The new title is part of an initiative that Marvel calls Big Shots where Daredevil gets to share the spotlight with Moon Knight and Punisher (in separate titles, of course). This should have everyone riled up, so please share your opinions and hopes for this relaunch in the comment section! Woo hoo! Great news, Christine. Ooo, and Bendis and Maleev on Moon Knight – oh, niiiice. I might, might, get this in trade format if it has a great writer attached. And by great, I mean great. Like Greg Rucka, Peter David, or by some absurd miracle Frank Miller returns. Someone with proven well above average talent. If its just generic Marvel writer #7, I’ll be passing on this. And if the new writer doesn’t at least acknowledge the NUMEROUS plotlines still left over from “volume 2” I’ll be skipping totally. Marvel needs to show some respect for their best character, because they certainly haven’t for the better part of the last year. 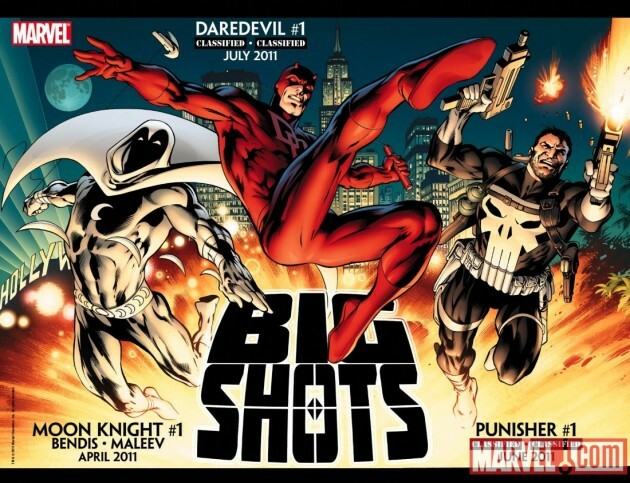 Marvel Knights sounded cool, Big Shots? … I think not. I never had a doubt DD would be back … be back? That’s what I’m supposed to think right, with the title shell game; he never will never have gone away, we’ll just be paying more for his book. As far as the creative team, I’m sure they will be ok but right now I’m thinking, lucky Moon Knight. I’m excited for the prospect, but I was excited about Shadowland as well. I’m hoping that Jason Aaron will write Daredevil, and I hope that Renato Guedes is the artist. I’ve really enjoyed what they’ve done on the first arc of Wolverine’s re-launched title. I’m also hopeful that Marvel will be sensible and price the series at $2.99. They’re clearly trying to revitalize Moon Knight, Daredevil, and Punisher, so why not price them at $2.99 since they’re trying to garner readership instead of scaring people away with the dreaded $3.99 price point? My money is on Aaron for Daredevil and Diggle for Punisher. @Krakkaboom: I think Jason Aaron might be a pretty good bet actually. I’m also hoping that the price will stay at $2.99. That would be a really smart move on Marvel’s part if they really want to give their more marketable B-listers a genuine shot at gaining new readers. Alas, I doubt it will actually happen. Diggle as the new Punisher writer is a surprising suggestion. It looks like he’s got something new planned at Marvel after his Cap mini, but I’d still be very surprised. I’m so glad DD is coming back, and that it will be much sooner than expected. We’ll only have around 2 months or so without a DD book on the shelves before the new #1 hits. I thought it would have been much longer given what editorial has said recently (that we may not need DD for a while after Diggle is done Reborn and such). I’m eager to see who the creative team will be, especially given the promise of “grade A” talent. Overall, this is exciting news and just what we’ve been hoping for.